This post offers advice for spouses who have found themselves, along with their partners, at the stage in life during which “in sickness and in health” has transitioned from being a promise to being their daily reality. Spouses do some of the most thankless, difficult caregiving work, despite the fact that they are also often seniors. This post aims to help caregiving spouses find balance in their lives, learn to practice self-care, and find the support they need in order to sustainably continue to offer their own support to their partner. For most of your lives together, you and your spouse have been partners. In the past, when you’ve faced a challenge, you’ve had a partner at your side. When your spouse requires care, the balance of your relationship is thrown off. 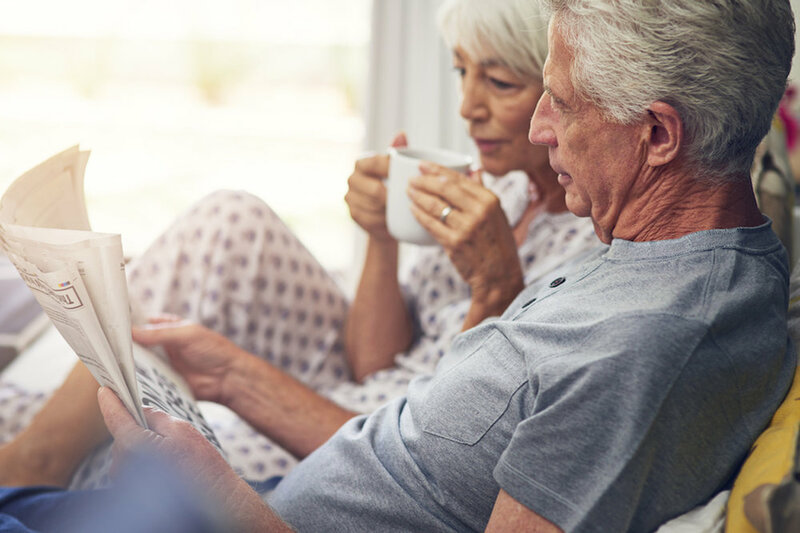 Your spouse will do their best to adapt to their health condition(s), but they have lost the ability to perform certain tasks, and those tasks now belong to you. This can be a difficult change to deal with, as you may begin to feel more like nurse and patient than equal partners. In order to avoid feeling as though your husband or wife has been replaced by a patient whose needs you must attend to, Dr. Barry J. Jacobs advises trying to compartmentalize your roles as caregiver and spouse. He recommends carving out time for the two of you to just be partners. Ideally, this time should involve no talk of medical conditions or caregiving, and should be focused on spending quality time with each other, conversing about other topics or partaking in an activity you both enjoy, like watching a movie or playing cards. Spend time as two people in a committed and loving relationship rather than as two members of a caregiving relationship. Dr. Jacobs also emphasizes the importance of finding a way for your care-recipient spouse to be generous in your relationship. Your spouse may not be able to whisk you away on a romantic getaway, and perhaps they can no longer even help you wash the dinner dishes, but you both need to continue contributing actively to your relationship. If you are consistently giving to your spouse, and you feel like you are not receiving anything in return, resentment can easily build. Dr. Jacobs points out that even if the care-recipient spouse is experiencing numerous health problems, they can still listen to their caregiving spouse, validate their feelings and struggles, and provide emotional support. Depending on your spouse’s individual condition, there are many possible options that will allow your care-recipient spouse to give to you in turn. Perhaps they can no longer cook - but they can choose recipes and help you make a grocery list. Maybe your spouse is no longer able to do yard work - but they can sit outside with you while you weed the garden, or help you research a landscaping service. Together, the two of you can find a balance of give-and-take that suits your relationship. Not even trained medical professionals can be caregivers during every moment of the day. Everyone needs moments to unwind, relax, and destress. Indeed, taking the time to practice self-care might be even more important for spousal caregivers, who almost always live with their spouses and are consequently 'on duty' as caregivers at virtually every moment. The stress and/or the physical exertion of caregiving can cause the 'healthy' spouse to suffer a decline in their own mental or physical health. To prevent this from happening, the best thing you can do is to make a concerted effort to care for yourself. Self-care is different for everyone, and you'll have to decide what works best for you. Self-care might involve indulging in relaxation: take a bubble bath, spend time at the spa by yourself or with a friend, or allow yourself time for a nap. 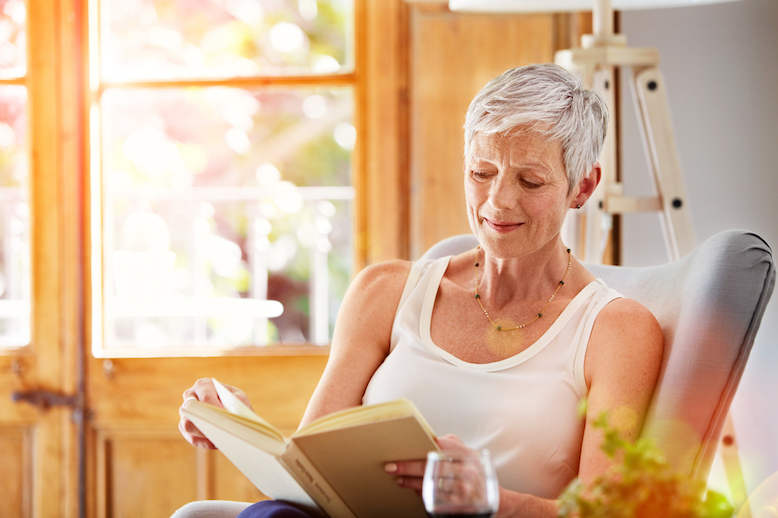 For caregivers, decompression often involves taking time for themselves, during which they might read or watch television, partake in a favourite hobby, or enjoy a nice meal. For some people, spending time with friends and talking about anything but their caregiving duties is a renewing sort of self-care; for others, a regularly scheduled appointment with a therapist or meeting with a close friend might provide much-needed time to unload everything that seems to be weighing them down. It's also important to practice self-care in small ways on a daily basis. The Public Health Agency of Canada recommends taking brief walks, making sure you're eating a healthy and balanced diet, avoiding over-caffeination or consuming too much alcohol, and getting as much sleep as you can. An inability to concentrate, or "brain fog"
If you are experiencing burnout, try out some of the methods of practicing self-care listed here, or take care of yourself in any other way you believe will help. A simple period of rest is a great place to start: if you can, take a nap, or retire early in the evening. Sleep will likely help relieve some of your "brain fog" and equip you to think through the other ways you might be able to take care of yourself. Family and friends are great sources of support, but unless they too are also spousal caregivers, they may not fully be able to empathize with the struggles you might be facing in your day-to-day life. If you find that you’re not getting the support you need from your loved ones, there are groups designed to provide caregiving spouses with support. In many areas of the US and Canada, there are community-based support groups for caregivers. There are also numerous support groups for caregivers connected to foundations that offer support to families affected by diseases like Alzheimer’s, Parkinson’s, and various forms of cancer, among many others. Since spousal caregivers do face their own unique challenges, you may be more inclined to join a support group organized through the Well Spouse Association, which offers support specifically for spouses in both Canada and the US. If there is not a support group in your area, the association also has phone support groups. Additionally, the Well Spouse Association organizes an annual conference and also coordinates respite events, which allow spouses to have some time away from their caregiving duties and the opportunity to connect with others who understand their experiences. If you are among the 34% of caregivers over the age of 65, you may be in better health than your spouse, but chances are that you are experiencing the unavoidable side effects of growing older to some extent. You may have less energy than you once did, or be dealing with arthritis and/or reduced mobility, or you may have a chronic illness yourself. No matter the state of your own health, it’s important that you remember that you are also deserving of care. This might mean engaging in some of the self-care strategies included in this post, or learning when to say "no," or giving your own health the attention it deserves - or, very likely, all of the above. If helping your spouse out of the bathtub hurts your back, explore other options, such as grab bars or seeking the assistance of a qualified caregiver. Don’t prioritize your spouse’s health over your own: if you are feeling ill, make a doctor’s appointment for yourself. If you find yourself exhausted from providing care overnight, look into alternate options, like hiring a nighttime caregiver or getting some assistance from family members. Remember that you can only be an effective caregiver if you are well-rested, healthy, and not experiencing burnout. Recognizing your limits is beneficial to both you and your spouse. While it can be hard to admit to ourselves that we need help, and even harder to ask for it, it’s essential to find the courage to do so. Unless you’ve said otherwise, it’s a strong possibility that your loved ones believe that you have all caregiving duties under control. Talk to your family members, particularly your children, if you have them, and let them know that you need help - even if they’re unable to provide this help themselves due to distance, demanding jobs, or other reasons, they can assist you in the effort to find ways to ease some of the pressure you are feeling. Support groups and community organizations like seniors' centres are also great places to get information about services that can supplement the care you are already providing your spouse. Like all caregivers, spousal caregivers face challenges. These challenges can feel particularly intense when you are providing care to someone who has previously been your partner not only in your romantic relationship, but in maintaining your household, in making decisions, and in countless other areas. However, like all other caregiving relationships, it also has its rewards, and by practicing self-care, setting limits, finding support, and creating balance with the input of your spouse, you and your partner can find ways to navigate the new phase of your lives together.